The new Kyrie Irving 1 shoe has been officially been lifted of its veil. 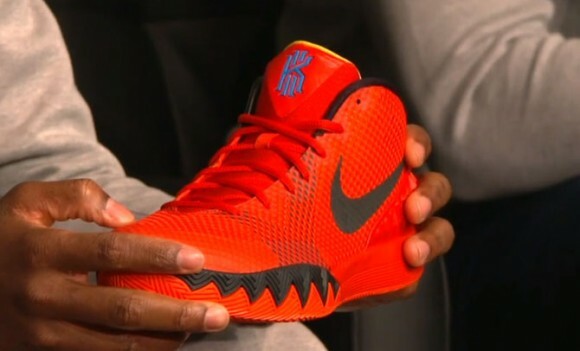 Nike Basketball hosted a live event on 12.3.14 to unveil the newest signature model. I was lucky enough to be able to watch it. The shoe looks amazing and I definitely want to get my hands on pair. There are many inspirations from personal acronyms, to his late mothers name. This is Nike’s first signature model since KD in ’07. Two colorways were revealed. A crimson one and the colorway we’ve been seeing for months now. No price tag or release date has been officially revealed yet but expect one in the near future. Just stay tuned to the site, and you’ll have all the info on how to cop and the price tag. These should be just $110 I think, nothing looks amazing. Agree 100%, these kicks do NOT look amazing. Really NW? Pay attention to who is writing. They remind me of the kobe IV, throw a carpe diem colorway and I’m sold. The Swoosh placement is good and the traction looks beast. The rest….. I was playing around with these on ID, and as generic as this sounds, I’ve got to say, the black yeezy color blocking on these looks phenomenal. And this is coming from someone who hates that color scheme on any shoe other than actual yeezies. Curry1 > Kyrie 1 all day! I dont have anything positive to say so… but these might turn out to be performance monsters. You just never know nowadays. So, for what it is designed for, it may be extremely good. I’m definitely not discounting the shoe at all. Even if you don’t like the looks, it very well could be a good performer. Very true bro. I hope so for the sake of those who will purchase. There’s got to be some serious performance going on here. all signs point towards it being a no-nonsense, no-frills performer, somethiing you lace up, play a few hours of pickup in, the shoe fading to the background as you get buckets and play lockdown defense. somehow i’m praying that it’s going to be like the hyperdunk 2012 low for me. The ushering of Kyries shoe means the exit of Kobes line. I’m thinking the Kobe 11’s will be the last for him. These remind me of the first hyperfuse that came out in 09 I think. forefoot zoom, and hyperfuse upper. Of all the current NBA players that have signatures with Nike I would rank these 3rd behind Kobe and lebrons and above KD compared to their first sig shoe. So Leo Chang is the designer. I like the guy and have nothing against him, but I wish Nike would’ve paired Kyrie with his own design lead and let Leo focus more on the KD line. Now it will seem like who gets what and who gets held out on to keep the tech and style different from the KD and Kyrie sigs. Not feeling them. They look very ugly although it can be a performance beast. sorry kid, but these are ugly. Heel and forefoot zoom would’ve been great. Full length zoom would have been crazy. But with just zoom in the forefoot and phylon in the heel these are basically a hyperfuse. Traction does look good. Wish Nike would have added a bit more in the heel for cushioning.